R.Albegov won the bronze medal at the 2012 Summer Olympics in the men's +105 kg event. The +105kg category at the 2013 Worlds featured some outstanding performances by Russia and Iran. 21 year old Bahador Moulaei snatched 203kg Rusla Albegov went 197, 205, 209kg Alexey Lovchev went 191, 196, 200kg In the Clean & Jerk Ruslan made 242, x255 and 255kg on his third. He was really pushed by Bahador who made 241, 255, x261 (cleaned it!). 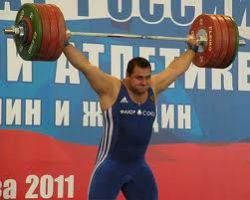 Ruslan’s 464kg total is good enough to win the Gold Medal.